Posted on April 18, 2017, by & filed under apartheid, Communities demolished, House Demolitions, Personal Experiences, Summer Camps. 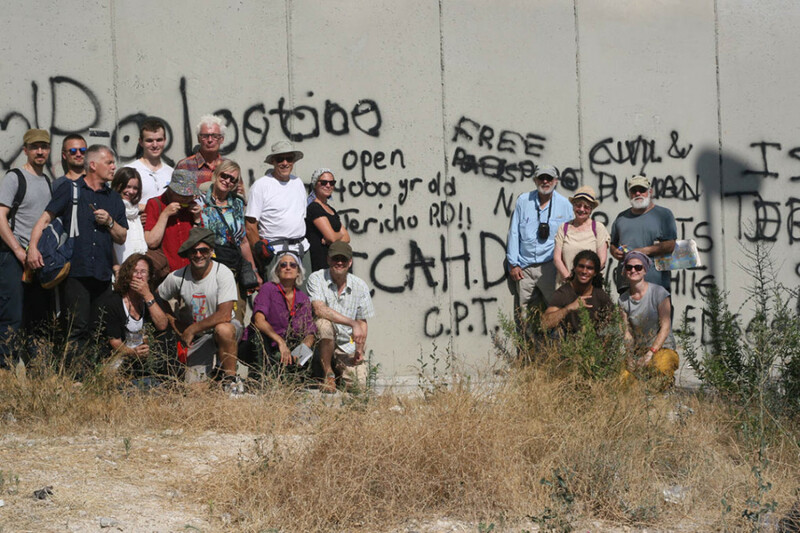 ICAHD Rebuilding Camp participants next to the Israeli Apartheid Separation Wall. Arriving in Jerusalem to join the ICAHD 2015 Summer Rebuilding Camp was an experience I shall not forget. I travelled with some hazy notions from my father who served in Palestine after the 2nd World War, and from my grandmother who visited as part of a church group in 1966 plus some academic ideas from the books and articles I had read. I was not prepared for the overt militarisation of the general population, people openly carrying heavy weapons whilst shopping or strolling about, the frequent army patrols, helicopters, observation posts and a pervasive aroma of hostility. No sooner had we arrived at our camp than the helicopters were registering our presence. As Bedouin children played in the rubble of demolished houses and shouted to ask our names the military post across the valley carried out machine gun practice. The Separation Wall ran along the valley floor, Jerusalem spread south to the horizon. We ‘camped’ in the ruins of the house of our hosts. We are a rich collection of people from USA, UK, Finland, Germany and even Australia. We ate, slept and lived outside, taking great care to use the minimum of water as every litre of water has to be bought at high prices. We were introduced to the trajectory of the separation wall, arbitrarily slicing though previously Palestinian suburbs of Jerusalem, weaving among Jewish settlements and refugee camps, separating Palestinians from their ancestral lands. Crossing the wall as internationals we were not normally stopped at checkpoints, but it was easy to see the long lines of Palestinians invariably delayed for hours. Initially it was not so clear the distinction between the Jewish settlements that inter-mingled with Palestinian homes until we were told to look for the water tanks. White is for Jewish homes with solar heated hot water who will receive copious water 24/7/365. Black is for Palestinians who have to store water against the many long interruptions to the supply they will experience. I had never known that water is used as a weapon. This was a very serious introduction to a dystopian world, superficially familiar, but which works completely differently according to your religious and racial background. I began to appreciate how incomplete are the stories we receive in the UK. A house is demolished because it has no building permit. That could happen in the UK, but we trust the administration that manages building permits, we believe it is honest, just, and open. We are not told that for Palestinians, it costs a year’s salary just to apply, and that in any case a Palestinian will rarely be granted a building permit, that most families are left with no option but to gamble and build without permission. We are not told how a Palestinian home can be suddenly made illegal by declaring a military zone, or archaeological site, or a nature reserve or appropriated to build houses for settlers. As our camp progressed the hard work and the genial friendliness of Palestinians came to be essential antidotes to our briefings about and observations of Israel control of the Occupied Territories. The Israeli occupation leaves no part of Palestinian life untouched: disconnected from water, driven from their ancestral land, made homeless through brutal demolitions, denied access to work, medical care, money. Unable to visit families and friends in nearby villages even finding a partner for marriage becomes difficult. Everything is designed to achieve the maximum humiliation, distress, frustration and anguish, to ensure that no Palestinian could doubt the overwhelming force of the occupiers. Children of any age can be summarily arrested, brutally treated in military courts, and freed only if they plead guilty for crimes they may well have not committed. The families then live with suspicion of their neighbours and friends that they had become informers, the children become withdrawn, anxious, do badly at school and wary of stepping out of the house. Fear is ever present. With the Israeli forces as observers, settlers descend on a family at will to harass them, abuse them, attack them. We learnt that the IDF role is to protect settlers, but not Palestinians. But we also met inspirational and courageous Israeli activists who often have to leave Israel, part from their family, ostracised by Israeli society, yet continue to fight for justice for Palestinians. I will also remember waking to the haunting and beautiful call to prayer floating over the night air, the sun rising over Jordan only a couple hours away (as an Israeli or international, but a day at least if you are Palestinian), the mist over the desert and along the Jordan valley. The ICAHD rebuilding camp has changed my life. To help build a house for someone in need is very fulfilling. The ICAHD program gave me a chance to learn from many very committed and deeply informed people. The international camp team were inspirational, freely sharing their wide experience and understanding. Some came from strong Zionist families and struggled to remain loyal to family whilst living their commitment to Palestinian rights. The situation in the Occupied Territories has deteriorated significantly since the summer camp as individual frustration and anger is countered with overwhelming repression and partial tendentious reporting. I am continuously reminded of my obligations to Palestine as reports arrive regularly about the increasingly challenging difficulties that beset the Palestinian organisations we visited, the husbands, mothers and children we met, the individual families who shared their experiences with determination but without rancour. I have been shown how easily our democracy institutions can be subverted, how we must defend actively our freedoms, both for ourselves and also for those we don’t agree with. I am lucky. My local Quaker meeting gives me much spiritual and practical support. My family is completely behind me. 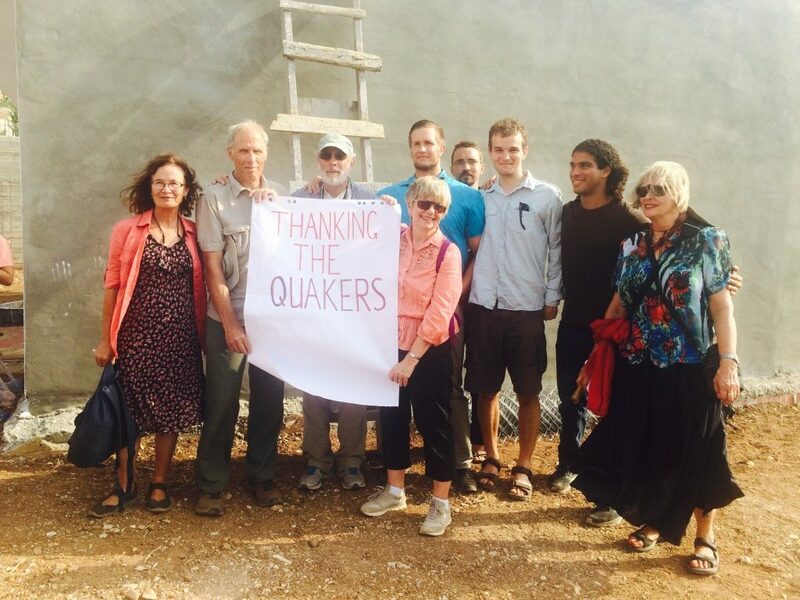 I have been able to tell many people about my experiences through presentations to Quaker and other groups. This continues, I can talk openly, write to politicians and challenge them to face the iniquities of Palestine. How different that is to Israel and Palestine.